The 8GB of files has allegedly been taken from the network of the Italian CNAIPIC which oversees the country's critical IT infrastructure. In a message announcing the release, the Anonymous hacker group said it received the files from a "source". 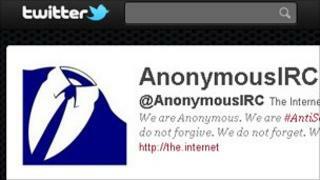 The attack on CNAIPIC is thought to be in retaliation for arrests of Italian members of Anonymous. Links to the first few confidential files purportedly stolen from CNAIPIC were placed on the Pastebin website. Anonymous claims the files were taken from the evidence servers of CNAIPIC (National Computer Crime Centre for Critical Infrastructure Protection). The documents include information about government offices such as Australia's Ministry of Defence and the US Department of Agriculture as well as data about private firms Gazprom, Exxon Mobil and many others. Preview images also shared by Anonymous reveal the management structure of CNAIPIC, pictures of staff and a long list of all the documents that have been taken. CNAIPIC has yet to respond to requests for comment. Officers from Italy's cybercrime division carried out a series of raids on homes of suspected Anonymous members in early July. Three people were arrested as a result.